When I was growing up and just learning about BMX, one track was already a legend in New Jersey. Craigmeur BMX. It was located in the Vernon Valley area and already by 1979 had seen an NBA National, all the pros and was known as THE track to go to if you were serious about racing. The track was started by Harry Myers. I had seen Harry a few times when he was running Puch, at the Jersey City Armory and the races Jimmy Cerullo held there. (That’s Jim and Harry to the left and left to right, James Cerullo, Harry Myers circa 1982) So…in my young mind he was already a legend. It wouldn’t be until 6 years later when I got to run the General Freestyle East Coast Team for 2 years that I actually got to meet the man. Typical of the BMX promoters of his era, he had unbridled enthusiasm for the sport and really wanted to see it do well. (When you can convince a company to rent Madison Square Garden for a contest, you are a major persona) I had been meaning to give Harry a call to get his view of getting BMX racing going in northern NJ and the General Bicycles days since he sent me an email about a year and a half ago saying hi and letting me know he was stoked I was still involved in BMX in some form. What follows is a transcription of an interview I had with Harry over the 4th of July weekend this year. He now resides in Texas and…well I guess at this point, we can let Harry do some talking. I should also mention that the interview is quite large, so in the interest of keeping people enthusiastic about it, I’m going to split it into about 3 segments over a couple weeks. Thanks Harry for giving us young guys a chance to go out and do what we loved, when we were young. Here is Harry Myers, New Jersey BMX promotional legend. What motivated me is the fact that the teenagers who used to ride at Craigmeur are now parents of teenagers in many cases; it just seems hard to believe that 30 some odd years have passed since that time. What year did you get involved, how did you get involved, what year did you open Craigmeur? The very beginning in 1977 I moved to NJ from Yonkers NY. My son had an Iverson bicycle that we bought in a department store and he busted it. There was bike shop in the town of Butler NJ called All Sports and my son had picked up a BMX magazine, he was only 6 or 7 years old but he saw it and we bought it for him and he said, “I’d like to get one of those types of bikes”. So I went to this bike shop and it was managed by a young man who was in his early 20’s named Ron Lipner. Who by the way now is with Kent Bicycles and is the manager of their Cadillac Bicycle Division. But anyway Ron was 23 years old at the time or 22 and he sold us a Raleigh Rampar bike. The Rampar was made by Raleigh and that was a BMX style bike, it was strong enough to take the bumps and the jumps and my 7 year old son who was already proficient in riding mini-bikes and bicycles, really got carried away with it and loved it. Ron Lipner at the bike shop said, you know they have BMX racing out here at Vernon Valley. It was run by one of the owners of Dean of Sports, somewhere in North Jersey and they have a little track that they have that runs every couple of weeks in Vernon Valley. Why don’t you take your son down there and see how he does. So I did. I took him down there he got 3rd place the first time he ever raced and he loved it. While I was there I met another parent another parent whose kid was racing. Now this parent was a drag car racer who used to like drag racing and he believed in good equipment and his kid had the Redline and it looked..wow! This kid really has the top of the line stuff here and my kid only has a little Rampar but at that time I had just got it for him and I didn’t know how far he was going to go with it. His name was Jeff Platt, so I spoke to Jeff and I said Jeff this track is a good idea but I’m willing to bet that it could be turned into a real serious sport. Not just once every now and then on a little piece of dirt in the back. I’m willing to bet a lot of kids would show up for this and it would become a major sport, if it’s just promoted properly. He agreed, so I spoke to him and he said Harry, “I’ll tell you what, I have a background in excavation and stuff like that”, he said he would know how to form it. “If you wanna go ahead and see if you can get this organized go for it.” At that time I was not in the bike business, I was selling boxes for a corrugated company. (At this point Harry asked if I was with him so far and I explained I was recording the conversation completely, little did he know that I was sitting there fascinated at 42 years of age learning how BMX took shape in my state, LOL) So what I did and this was late in the fall when all this racing was taking place Jeff Platt and I said this would be a good idea and I spoke to Ron Lipner from the bike shop and said how would you like to get involved with this you could do the administration of the races themselves, kinda organize the track and see if we could put it all together so it’ll make sense. He said he’d love to do that. He was a real bicycle enthusiast himself. So the three of us decided to form a partnership that we decided to call Bicycle Racing Enterprises, we even incorporated it. What I did was, I would travel around while I was selling corrugated boxes on the road representing the company. I would stop at the bike shops and ask them what they thought of the idea and they said if you could do something like that it would really benefit our business. We know it’s beginning to develop on the west coast but it’s non-existent here. Well, that gave us a good shot in the arm. For the love of the sport and because I saw that my son liked it so much I really pursued it very, very aggressively. I went to every bike shop, got their support, went to Schwinn and they gave me an 8mm film and a projector and I looked around and I went to Craigmeur and I asked the owner, “Ya know I live just a few miles from you but I’ve noticed in the summer time you guys don’t do anything. I know you have some restaurants but there’s no skiing. Ppeople come here because they know you exist but not much really happens. I said if I could bring people out here with a sport that would certainly be a cross section of people that would know more about your ski area, and would use it during the winter time, also at the same time, would patronize your restaurant and would bring you some revenue as a result of the percentage of whatever we bring in, would you be willing to do that. And they said, “sure”. I said, I noticed you had a bulldozer, would you volunteer your bulldozer free of charge for us to carve our track on a portion of the area that you really don’t use for skiing. And they said, really no problem, we’re willing to take the risk. The owner of the ski area was Bill Murray (honest but just not THAT Bill Murray), and what I would do is I would take that 8mm film and I would play it at the ski area. And this was from November through February. People got interested, I made posters, I even put out an ad in bicycle motocross action to attract people. 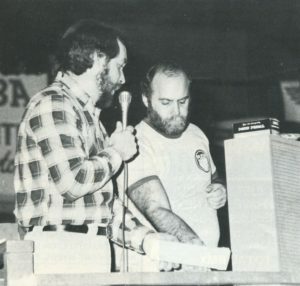 (There it is to the left, BMXA June 1978) The problem with our group of guys is that we just didn’t want to invest a lot of money into it but we knew that the industry, if they took interest would be more than happy to help us out. So I went to Raleigh and I spoke to vice president of sales and asked him if he would be willing to loan us some bicycles for rentals for kids that would come out there out of curiosity that didn’t have a bike to race. He said sure, he gave me like a dozen bikes. He said I’m not going to loan them to you, you can have them, if you can do something like that, they’re yours. Then I went to get some helmets and a company called Joffa who made protective knee and elbow padding for the hockey industry and also helmets for them gave us all kinds of protective equipment. So we were ready for opening day, we had everything we needed. Then opening day came in the spring, sometime around the middle of March. And we had over 500 people show up that day, on our opening day from all the promoting. From that point on it took off and I was offered a job at Puch a company that made mopeds and had a small line of high end bicycles and they wanted to get into the BMX bike business and they hired me away from the box industry, so I now became part of the bike industry. 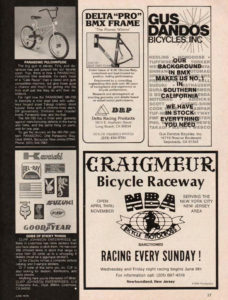 Craigmeur became a very thriving track that drew so much attention that the Schwinn National Tour that started out in California and was supposed to end in Chicago and decided they were going to continue on and have the NBA in NJ. By the way that’s the sanctioning body we used which was the NBA, the one we saw in BMX Action. NBL, ABA was just starting up at the time. So the NBA nationals came to Craigmeur instead of ending in Chicago and that’s when all of the top stars that you saw in the magazines, ya know Stu Thomsen, the Pattersons, you name em, all those guys were there. It made quite a commotion and it really spurred BMX on in the northeast to become a very viable sport, more and more people were now hearing about it, the bike shops were stoked and they were forming teams. 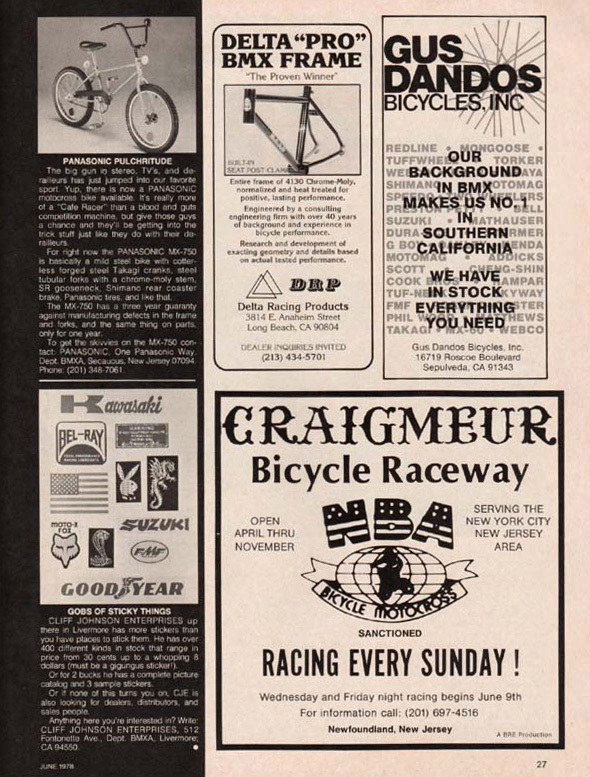 It got to the point where Craigmeur was the place to go if you were into BMX. So Jeff Platt, Ron Lipner and myself ran the track along with our spouses. Now Ron didn’t have a spouse but he did quite a bit of work. Jeff, who loved drag racing even made a sequential starting gate with lights on it like in drag racing. He was really into it. Ron decided at a given point that it was a little too much for him and he was more interested in being someone who was just involved with the kids and not so much the administrative duties of the track. So he dropped out and it became Jeff and I, we took over. We found out from the national event that came from California that these kids you read about in the magazine including Bob Osborn the publisher of BMX Action, said we have never in our lives seen anything like this. This is a real commercial track. I mean this is a track that is run like it’s a business, not that like it’s a little backyard thing. He said although our photography may lead you to believe that BMX, even though it’s a very popular sport out here, the tracks are not of the caliber of what you are doing. Not even close. And I wanted to continue it at that level. So Jeff dropped out and started another track which was NBA, and I was approached by the ABA at that time headquartered in Arizona (still is!) So I mentioned to all the families, we’re going to transfer all your NBA points over to ABA points but we’re changing the sanctioning body. Which we did. And it continued as an ABA track till it’s last day. But around this time more tracks were beginning to open up, there was James Vincent and Braddock BMX, he was one of our original people who used to come out. He had a team and he wanted to localize the sport and tracks just started popping up. We had a lot of visitors from all over the tri-state area that would come out, one of them was Clayton John, who is now the president of the ABA, he had a bike shop out at State College called John’s Derailleurs, he was a regular there. We had a lot of people that used Craigmeur as a model to start their own tracks and improve upon it as well. The Gleason’s as well at Howell, said give me some ideas, Harry you’re doing the right thing. I said Bob, the more tracks the better. There was another track that opened about the same time we were opening, in Vineland (yes, THAT Vineland, a certain famous racer is from there.) The people that were the principles there were the Zeuners. They had a son named Sal Zeuner who was a very accomplished rider as well, (NJ’s first Pro BMX racer AND BMXA coverboy) and we used to visit their track occasionally just to see how they were doing it. And it started to grow and that’s…basically what happened. He was the one who started the NBA. He was a very stereotypical type of Californian. I mean he was so laid back and he came out with his girlfriend and they put on the national races. He was shocked; he couldn’t believe that it was as big as it was here. It just blew him away; he said where are all these people coming from? He said, this is New Jersey! I told him, hey you started something. I mean he was the guy who really got it started had it not been for the NBA and all of the original riders from California and Bob Osborn and his magazine BMX Action it wouldn’t have happened the way it did. He was the motivation and he was the inspiration. The one who made it look real was Bob Osborn. He took a backyard sport which the NBA was all about. Ernie was originally a motorcycle promoter, he would take a big elastic band put it in front of the riders, let it go snap and everybody took off on their motocross motorcycles. I mean that was Ernie Alexander’s thing. And then he thought BMX would be a cool thing to do for the kids. And Bob Osborn, because he was a genius when it came to publishing, made a magazine that would make this look like the best thing since sliced bread for kids. Which he did, and I believed it. That’s what inspired me to do Craigmeur, I said ya know if they can do it there, we can do it here and obviously they must be doing it at a very professional level. That’s why when the California kids came out and looked at Craigmeur, they said, this is nothing like what we have, and downhill, this is too gnarly we’re gonna get hurt on this, lol. But, we’re gonna do it anyway, and these rocks, where did these rocks come from? They had never seen anything like that before. We didn’t know, I said look, this was all in our mind’s eye of what BMX racing should be. They said well, you kind of took it to a different level but that’s cool. And they were good, they were still winning, it didn’t matter. They blew away all those kids when they came because of all the experience they had and the weather they had year round, which allowed them to ride the way they did. But Ernie Alexander, he was really the guy who made it all happen from the very beginning.